- Large play and picnic areas. 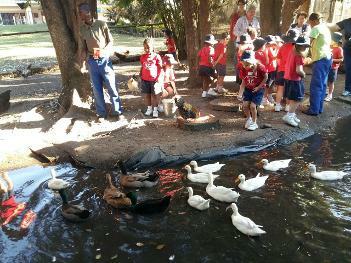 - Handling and feeding of farm animals. - Jungle gym, trampouline and swings. 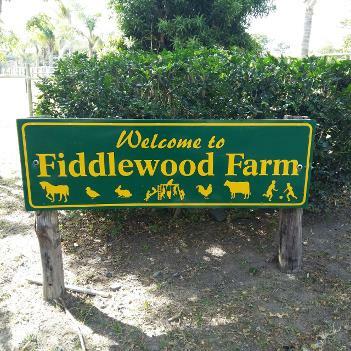 Fiddlewood Farm is a small holding nestled in Margate, KwaZulu Natal. 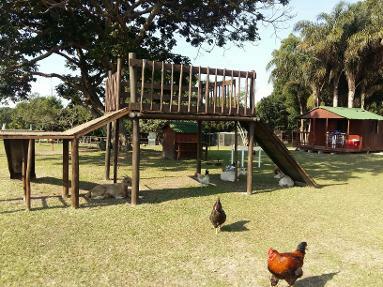 The Farm offers a wonderful outdoor space and experience for children's school outings and parties. The Farm is open on weekdays, includingholidays - by appointment only. Owner and farm-lover, Heather Bense had the privilege of growing up on a farm herself and has always felt most comfortable in a country environment. Having three children of their own, she and her husband, instinctively knew that one of the best gifts they could give their children would be to bring them up in a country atmosphere. "We have such a beautiful, outdoor friendly climate in this country. I think it is so important for children to run around with the earth under their feet, climb trees, float seed pods down the stream and learn straight from nature itself. For some children this is not the norm and birthdays and special occasions are most often spent in a Mall or concrete environment. 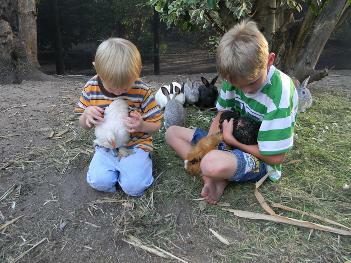 I like to think that our Farm offers authentic, unpretentious, earthy and farm-yardy kind of fun!" Fiddlwood Farm offers teachers and parents the opportunity to bring children out into the country for a morning or afternoon to do just that. Bookings can be made by going to our 'Contact Us' page and sending an email or you are welcome to phone the Farm directly. "It was delightful to see the children so excited by the wide open spaces: running up and down to the stream, patting the baby goats and of course werethrilled by the miniature horses." -- Barbie Meyer, Actress & Drama teacher, Margate. "My girls had such a ball at Fiddlewood. 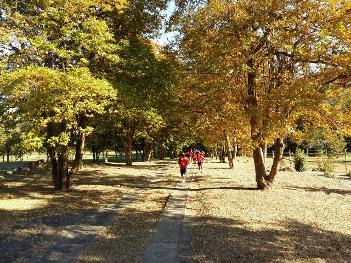 The whole place has a great, outdoorsy atmosphere and peaked the childrens' curiosity about all things natural - we just loved it." -- Linda McKenzie, Teacher and Mother of three, Margate.